Fifteen-year-old Ashley has a complicated life. There's no doubt her overachieving parents love her, but they are wrapped up in their own worlds for so much of the time it leaves her feeling like she's alone. Like a lot of teenagers, Ashley dreams of other worlds, but unlike a lot of teenagers, her world is about to collapse as rifts to an ancient fae kingdom begin to open all around her. With the arrival of a supernatural hit-squad intent on killing her, and an unexpected inheritance, Ashley's London is about to become a magical and mysterious warzone where the prize is Ashley herself. Ashley has to find out the secrets of her own life before she is killed. Balancing ancient prophecies, schoolwork, and the love of her life is difficult to say the least! 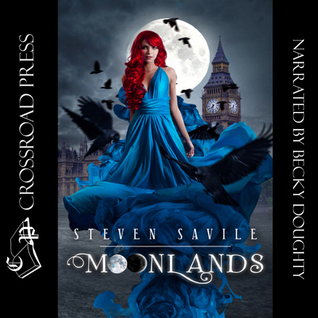 Take part of the wonderful world of Moonlands. Steven Savile (born October 12, 1969, in Newcastle, England) is a British fantasy, horror and thriller writer, and editor living in Stockholm, Sweden. His published work includes novels and numerous short stories in magazines and anthologies. This book stared out very slow. It took me till about halfway through the book to really get interested in the story. I think there were also to many characters, which meant that they we didn't really get to know them. I think that this book was too short for how much was jam packed into it.